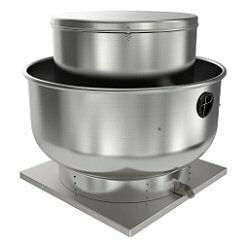 Belt-drive up blast ventilators are designed for roof mounted exhaust of commercial and industrial buildings. There models are both for roof and wall application (except 5BDU30 and 5BDU36). Durable spun aluminum construction with steel support braces. Backward inclined aluminum fan wheel. Motor and wheel are easily detachable without removing ventilator from curb. Permanently lubricated ball bearings (5BDU10 - 5BDU13) and regreasable pillow block bearings (5BDU15 - 5BDU24).